The match between Liverpool and Arsenal has always been a fascinating contest. 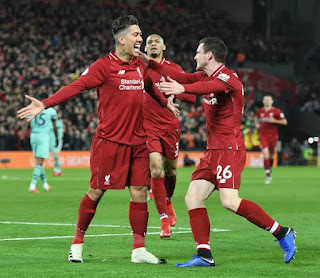 Liverpool hosted Arsenal in the Premier League 2018-19 match on Saturday, and the footballing fans were not left disappointed as goals galore in the opening 20 minutes of the match. Firstly, Arsenal midfielder Ainsley Maitland-Niles opened the scoring for the Gunners in the 11th minute after Alex Iwobi played a perfectly timed cross to set-up Maitland-Niles. However, Arsenal’s plans were soon spoiled by Liverpool as their star forward Roberto Firmino netted a brace to give The Reds the lead. In the 14th minute, Mohammed Salah took the ball in the right wing and cut back to unleash the shot, however, he was tackled by an Arsenal defender just before he struck the ball. Shkodran Mustafi cleared the ball, but it ricocheted off another player and landed straight at the feet of Firmino, who tapped in and equalised the scoreline. Just a couple of minutes after the equaliser, Firmino displayed some silky footwork to leave three Arsenal defender for dead and get one on one with goalkeeper Bernd Leno before rattling the net with a sweet strike to hand Liverpool the lead. It was Firmino’s 6th strike of the season in Premier League as he is now the third leading goalscorer for Liverpool. Sadio Mane later doubled Liverpool's’ lead after tapping home a Mohamed Salah cross in the 32nd minute of the match. Salah then extended the lead after he smashed a penalty just at the brink of halftime. Firmino later completed his hattrick after scoring a 65th-minute penalty. The Jurgen Klopp-managed Liverpool are on a dream run in the Premier League this season as they are undefeated in the league after 19 game weeks. They sit atop the Premier League table with 51 points to their name with 16 wins and three draws. The Reds have scored a staggering 47 goals and have conceded just 8 goals in the league. They are nine points clear after the 5-1 victory over Arsenal.